In a stunning top quad, Joseph Bihlmeyer took first place honors with 2.5/3. However, Scott Buono stole the show with draws against all three of his very formidable opponents! 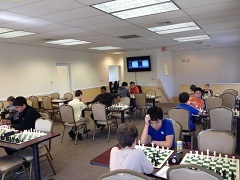 Derek Chen and Kenneth Young had strong performances in in quad two, sharing first place with 2.5/3 each. Carl Scovens scored the fourth 2.5/3 score of the day, inching him closer than ever to reaching his goal of 1500. The fourth section was a six player swiss, and once again, the winning score was 2.5/3. Robert O’Neill took sole first place. Meanwhile, Allen Dong and Alexander Kupersmith tied for second with 2/3 each.